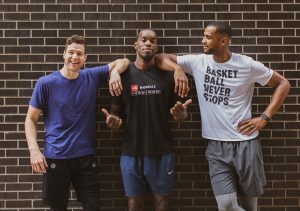 How three BYU greats found their way back to the same court for a whirlwind TBT final-four run. Former Cougars Jimmer Fredette, Charles Abouo, and Brandon Davies. Photo by A.J. Rich. It was a final four with all the frills: the Jimmer buzzer beater, Jimmer from deep, Jimmer coming in clutch to tie it up down the stretch. And BYU Cougardom (and basketball lovers everywhere) got to experience all the feels—all over again. Jimmer Fredette (BA ’16)—the man, the legend, the verb (remember the “Teach Me How to Jimmer” signs? )—was back on American soil this summer putting on a show in The Basketball Tournament (TBT), the single-elimination showdown ESPN has put on for four years now to fill the summer basketball void. The stack-your-own-team, winner-take-all tourney has a $2 million pot—and guess who led the whole thing in scoring. BYU’s very own 2011 Naismith Player of the Year. Alongside Fredette? His 2011 BYU teammates Brandon Davies (’13) and Charles Abouo (BS ’12). It was a kind of BYU Sweet 16–season reunion: three of the guys who made magic taking BYU to no. 3 in the NCAA polls reunited on the court, now vying for a championship for Team Fredette. “It just feels so natural to play on a team with them,” Fredette says of Davies and Abouo. “We know the lingo, we know how to play together.” And from their six-game TBT tear, they still know how to win. On Thursday night, Team Fredette was knocked out, one game away from payday. 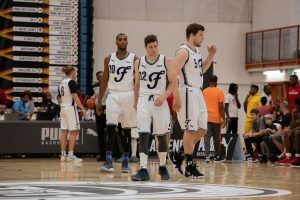 In the semifinals against Eberlein Drive, Team Fredette trailed almost the entire game but came alive in the fourth period—behind a barrage of Jimmer threes—to close a 15-point deficit, evening the score with minutes to go. While the game ended in heartache, 80–76, it featured enough Jimmertime to get BYU fans’ nostalgia flowing. Jimmer Fredette raises for three in a furious comeback in a semifinal matchup of The Basketball Tournament. Photo by A.J. Rich. The TBT put Jimmer back on the ESPN homepage, back on ESPN primetime, back in national headlines. And Jimmermania, never exactly dormant, sprang back to life in force. Amid all the déjà vu, one almost forgets just what year it is. Flashback to 2011. “San Diego State. That’s all I need to say,” says Abouo summing up the most fun hoops of his life. The game where Jimmer dumped 43 points on the then no. 4 Aztecs. “Everything that year was earned,” says Abouo. Their BYU squad ranked in the top-10 much of the season and smashed the BYU record books, while Fredette graced the cover of Sports Illustrated—twice—and was the unanimous national POY. For all the winning, the trio says their most meaningful growth at BYU came off the court. “The biggest thing I took from BYU were the relationships I made,” says Fredette. And yet, as they hung up their BYU jerseys, there was still basketball to be played for all three. Fredette, a 2011 draft pick, achieved his lifelong dream of playing in the NBA. A year later, Abouo began pro ball overseas. Davies played two more years as an all-conference center for BYU before finding his own place in the NBA. Since then, each has seen his fair share of shuffling. With the aid of two translators, one on the court and one off, Fredette now plays in Shanghai, China—and has made millions more fans. “People definitely know who I am over there,” Fredette admits shyly. “I get recognized on the street a lot.” With Fredette, the Shanghai Sharks made the Chinese Basketball Association playoffs for the first time in 15 years. He just finished his second season, making a reported $1.8 million and picking up a nickname, Jimo Dashen, the Lonely Master, and a shoe deal. “It’s a different type of ‘lonely,’” he explains. “Like you’re at the top and no one can reach your level.” Or so the name—now brandished in Chinese characters on his signature kicks—has been explained to him. Less publicized are the post-BYU careers of Abouo and Davies. 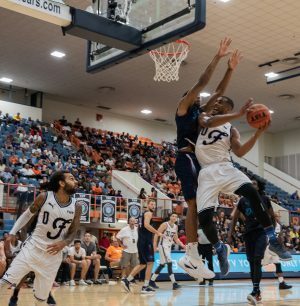 Former Cougar Brandon Davies dominated inside in Team Fredette’s semifinal loss against Eberleine Drive in ESPN’s The Basketball Tournament. Photo by A.J. Rich. Abouo, who speaks four languages, has played pro in Qatar, Egypt, Turkey, and Spain and most recently won a championship with Fos-su-Mer, a Pro-B team in France’s national league. Just as he did in his Y days, he continues to play for the Ivory Coast in international play. Abouo looks to Fredette. “We’re getting old, man,” he says. “Yeah, it’s unfortunate,” Fredette laughs. And Davies? Well, he just set off Brandon-mania in Lithuania. 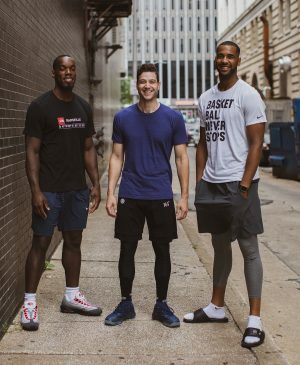 Team Fredette made a deep run in The Basketball Tournament in 2018, winning their way to the Final Four. Photo by A.J. Rich. And no matter where they are in the world, they feel the support of the BYU faithful. “You’ll have like 50 or 60 BYU fans—you know, the white people in the audience [in China]—with these BYU shirts on, yelling and screaming,” says Fredette. Back on U.S. soil in the TBT, the BYU support was amplified on social media—where their 2011 teammates also cheered them on—and in force at every game, from the first round in Columbus to the semis in Baltimore. TBT games have felt like home games, says Davies. “We’ve had the most people at our games out of anybody [in the TBT]. BYU nation is coming out,” says Fredette, who wants to be sure fans know the love is reciprocated. He lets them know in person whenever he gets the chance. Like on the morning of the semis, when Team Fredette is having a late breakfast in the Lord Baltimore Hotel. In stride two young men in ties and tags, Elders Stone and Patterson. TJ Fredette, Jimmer’s older brother, ran into the elders in the area and gave an invite. Jimmer jumps up, elated, pulling Abouo over. Stone attended a BYU basketball camp years ago as a kid—a kid they still remember. “You took me back in the locker room and gave me a pair of shoes and a practice jersey!” Elder Stone gushes to Abouo. On game day, with a hefty prize on the line, Jimmer and Abouo are all about their fan. Many factors affect the decision to join the TBT, “whether it’s smart to play,” says Davies. Like potential injuries. And giving up coveted time off back in the States. Fredette says they actually tapped some other members of the 2011 BYU squad to join up, but they couldn’t quite make it work. It’s not Team Fredette’s first TBT appearance. TJ put a team together last summer featuring Abouo and Davies on the court—and Jimmer as coach. “I’m not a very good coach,” he laughs. They were ousted the first round by Team Utah. But TJ wanted another go—and this time he convinced Jimmer to lace up. Unsure this year, Davies actually took to Twitter, asking BYU fans. For 1,000 follows, he posted, he’d play in the TBT again. He got more than double. “It was a no-brainer for me after that,” he says. 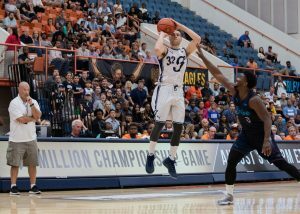 Three former Cougars headlined Team Fredette in ESPN’s The Basketball Tournament. Photo by A.J. Rich. For any sacrifice players make to play TBT ball—almost none of them get a payday—there is also upshot. The draw of the TBT competition, they say: the joy of the game. But perhaps most alluring is the chance to get another look. “There’s a lot of eyes on this thing,” says Davies. Last year 14 TBT players got NBA offers. 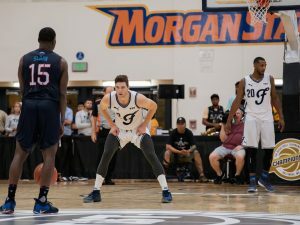 On that floor, BYU fans got to see how three BYU greats have blossomed into pros, perfecting old tricks: Fredette shaking defenders with his swinging crossover, nailing fading floaters. Davies finding every which way to throw down the dunk, including coast-to-coast and reverse jams. “I used to be very ball dominant,” says Fredette, who has worked to be better off the ball, to score in more ways, to up his defensive game. Now that would be mania. We spy a newcomer in blue in the student cheering section.